Life can get really busy, really fast. Or it can be slow, but still somehow not have any room in it, you know? Box 761 is full these days, but operating in slowtime. Since I last I wrote, I have somehow become a “book blogger”. I didn’t realize I was one, but a few people referred to me thusly, and I guess it’s what I am. In part, anyway. I’m working on a separate site for stuff that’s not about books or related to book bloggery in some way. That will appear some time soon, though I’m not sure when…. stay tuned. I have the domain name, but haven’t done the work around it. Sometimes when life gets that slow-but-no-room feel to it, I find that I can with some effort actually get a monstrous amount of work done. Other times, well, I have to take a month off (like I just did). Today, though, a reporter from Canadian Press interviewed me about e-books. I figured I might as well discuss it here, now that I’m being interviewed and all. So. Where was I? Ah yes. When last I wrote, I could feel a long treatise coming on. It was called “What is a Book?” and I started crafting long sentences in my head while in the shower, and finding all sorts of fabulous bricolage from my daily life that made its way into the shower-monologue. Then it got kind of old — in the way things go these days, the Giller seems a long time ago and all the issues seem old, and solved. My problem was that nothing got down onto, er, paper (for lack of a better word). And there’s the rub. What I was thinking of writing wasn’t dependent on the medium. What I was thinking needed to be articulated, but I wasn’t even fussy about the delivery method, as long as it was eventually articulated. It seems to me that much of the angsty teeth gnashing of the past month or so is built around this question, “what is a book?“. At first blush, though, it seems, I dunno, too obvious somehow. I mean, duh, we all know what a book is, right? n 1.a number of printed or written pages bound together align one edge and usually protected by covers. 2. a written work or composition, such as a novel, technical manual, or dictionary. In order to find that definition from my Collins Concise English Dictionary 3/e, (c)1992 I had to scan the shelves in my hallway for a few minutes. It has been a while since I used that book. The covers are on it, but the hard spine has been detached (though for some reason I kept it, and placed it right at the end of “L”). There’s one of those sticky arrows pointing to “serendipity” on page 1226. 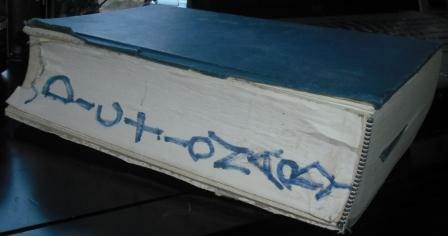 You get the idea — it’s a well-used book. If I recall correctly, I took it from the stacks at HarperCollins the year this edition was published — I think it was intended for a client, but ended up on my shelves instead; such is the way of publishing…. What I like about the snippet of definition above is that it describes both the physical object “book”, and the idea of “book”. I think those two things conflate in our minds when we think of it, and it’s hard to separate them, but often when we use the term “book”, we are actually talking about only one or the other of those definitions — not both. Otherwise, we wouldn’t have had half the kerfuffle with Gaspereau and The Sentimentalists, right? Since the time when that lovely dog eared and downy dictionary mysteriously found its way into my possession, the word “book” has expanded and contracted. Even then, though (way back in the mists of the early ’90s), we were talking about digital books — they weren’t in any way useful or accessible yet, but they were already in the discussion, and (tiresomely) feared. The internet was barely extant, and that was, I think, the year that I finally decided that I needed a computer monitor that had color. Now, in the second decade of the 21st Century, “book” is the word we use for a digitally delivered document. It’s what we call anything that has a discrete beginning and end and is written by someone, right? I liken it to how we all of us, of a certain age, still call a group of songs an “album” …. I say I wanted to “get it on paper” when, of course, what I really mean is that I wanted to put it on my blog and sent it out into the ether. I say wanted to “write” it, when really I was typing — a much different process, and one that I find almost mystically rhythmic — like playing some sort of weird piano that puts out words instead of notes. If punctuation is score (thank you John Metcalf), then my keyboard is my instrument. So then, what would the product of this activity be? Do I care if it’s electronic? No. Do I care if it’s artisanal? No. Do I care if it’s written in crayon on cardboard shirt-bards? No. I do, however, care if it’s well written. I care that it delights me and makes me think and makes me want to tell people about it. 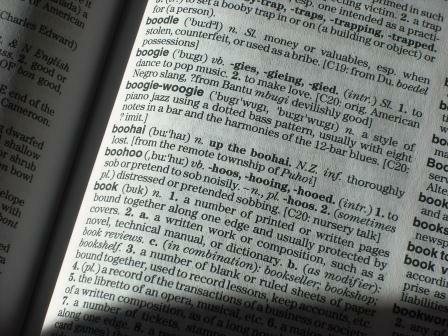 If it isn’t something that delights me, then I’m… uh, up the boohai (see photo, above). If I like it, I might buy both the e-book and the hard copy, who knows? I know that all the brouhaha around The Sentimentalists is probably old hat now, but this has been bugging me a little bit. This is the truncated box761 version of my “What is a Book?” treatise. I’m kind of over it, but want to make sure that’s it’s clear. Ebooks are not the end of literature. They aren’t even the end of physical books (see M. Wente’s ridiculous fluff piece, here). There’s room for everything as long as there are people with abstract thoughts. Now all I need to figure out is “What is a Book Blogger?” and I’ll be all set.